Shrimp always feels like an indulgent food, a luxurious protein reserved for special occasions. However, if you buy a bag of wild shrimp for under 20 bucks you can easily feed a family of four with some veg and a starch of choice. I really love to make shrimp on those super busy days when I barely have time to brush my hair in the morning let alone make a family meal. Shrimp only takes a minute each side to cook, a big plus over chicken or other meats. I do think it is important if you live in the U.S. to buy local shrimp. American farms are under strict environmental laws, making them a much better choice than imported, farmed shrimp. If you really want to get your hands on the best shrimp around, the pink shrimp fishery in Oregon is as wild and as good as it gets. Now to make this recipe you will need a food processor and a pan, and that’s about it! I tried to make this pic as drool worthy as possible. If you are salivating, read on and you can make this too! 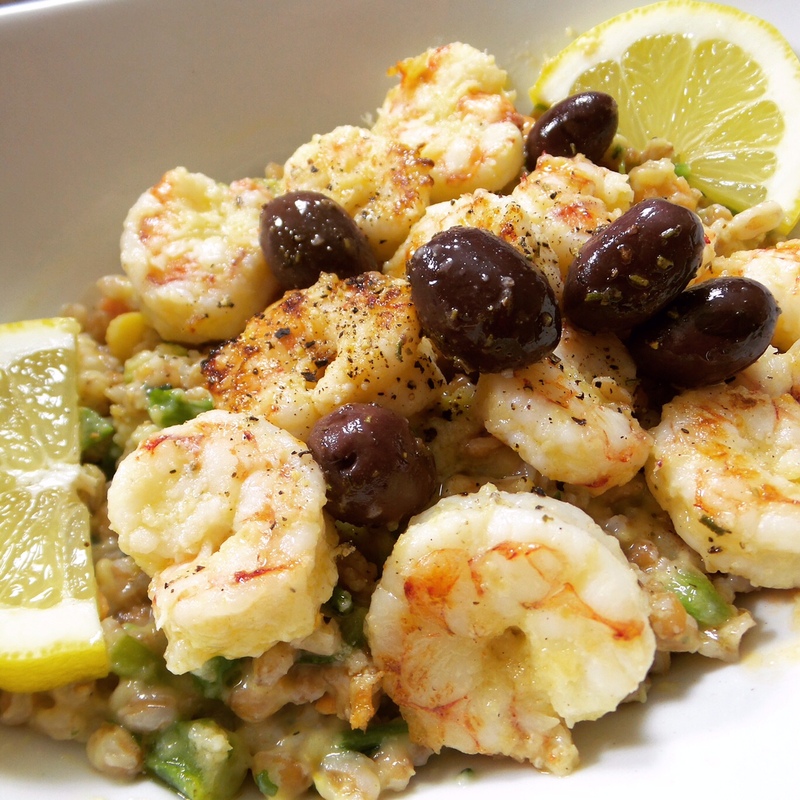 In the video below, I show you how easy it is to make the zesty shrimp, which I place on a bed of freekeh pilaf. For more information on this supergrain with a funny name, check out my blog on Freekeh soup. Rinse freekeh in cold water. Put broth in a sauce pan, and wait to boil. Add freekeh and olive oil. Stir, reduce heat and simmer for about 30 minutes or until liquid is absorbed and freekeh is tender (you might have to add a bit more water, keep an eye on it). While cooking, heat another tbs. of olive oil in a pan, start sauteing shallots. Then add the carrots. Saute carrots for about 5 minutes, then add the zucchini and saute for another 5 minutes. Add veggie mixture to cooked freekeh, along with lemon juice, zest salt, pepper, and toasted nuts or seeds. Now you have a beautiful bed for your happy shrimp to lie on 🙂 Check out the video, I welcome any comments and feedback! Previous: Previous post: How To Travel The World in Your Own Neighborhood….